The aft block on the boom should be directly over the rear traveler in all light air and some medium air conditions. This should produce a mast rotation of 45 degrees. This will produce a fuller sail at the entry, which will increase power and acceleration. 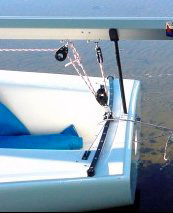 If your normal depowering adjustments still leave you over powered as the wind increases, reduce rotation to 40 degrees or even 35 degrees to flatten the entry, reduce drag and maintain leach tension. 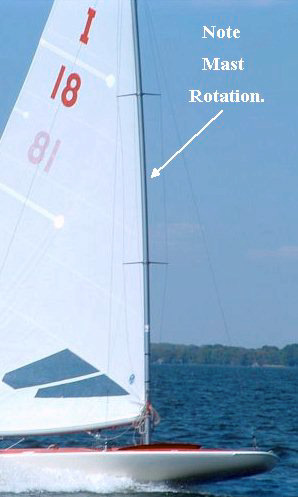 This is accomplished by moving the blocks forward 2-6"on the boom, the force of the mainsheet pulls aft on the mast this reduces the mast rotation.